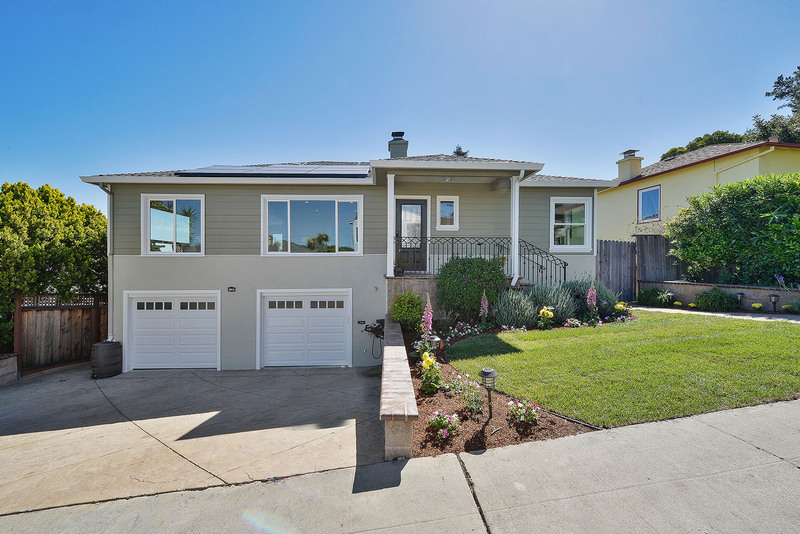 Located in the desirable San Mateo hills, this home takes full advantage of sweeping views across the San Francisco Bay and City skyline. Remodeled from top to bottom, the two-story floor plan has a chic, modern vibe with designer-selected colors, crisp white millwork, and an open floor plan unified throughout with fine hardwood floors. A wood-planked feature wall in the living area integrates a linear fireplace and recessed media and a dazzling cut glass drum chandelier defines the formal dining area. The open chef’s kitchen is a dream with quartz countertops, glass mosaic backsplashes, and stainless steel appliances. Breakfast/wine bar seating invites friends and family to join in, all while overlooking the amazing views that come to life at night with sparkling lights that reach the iconic San Francisco skyline. Entertaining continues on the home’s lower level, where a tremendous recreation room is a sports lover’s retreat with media area, surround sound, and even a refrigerator with built-in beer taps. And, extensive ledge seating provides ample space for large gatherings. Indoor/outdoor living is a feature of the home’s design with access to the oversized rear yard from each level. A spacious view deck off the kitchen has steps down to the ground level, where a large spa, expansive cushion-tiled terrace, and a playground await endless hours of enjoyment. The home’s personal accommodations include 4 bedrooms and 3 beautifully appointed bathrooms, highlighted by a main-level master suite plus a private lower-level bedroom and bath ideal for guests. Completing the appeal of this home is its close-in location just one mile to Hillsdale Shopping Center and less than a mile to hiking trails at Laurelwood Park.